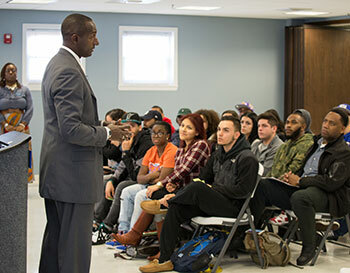 “The intersection of your gifts and your passion builds success,” said Randal Pinkett, PhD, the Berkeley College 2017 Black History Month guest speaker. The New Jersey entrepreneur addressed Berkeley College students, faculty and guests in Woodland Park, NJ, as well as those watching via livestream on each of Berkeley College’s eight campuses in New Jersey and New York, about the importance of adopting an innovator’s mindset in pursuit of entrepreneurial success. Known to millions of television viewers as the winner of NBC’s The Apprentice Season 4, Dr. Pinkett has established himself as an entrepreneur, speaker, author and scholar, and as a leading voice in business and technology. He is the founder, chairman and CEO of BCT Partners, a multimillion-dollar management consulting, research and evaluation, information technology, and data analytics firm based in Newark, NJ. 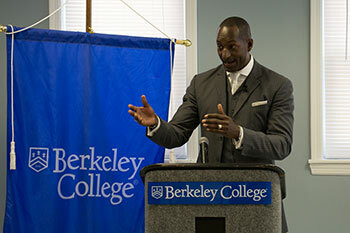 Photo Captions A and B: Entrepreneur and author Randal Pinkett, PhD, addresses Berkeley College students, faculty and guests in Woodland Park, NJ, on February 15, 2017, as the 2017 Black History Month guest speaker. Before taking questions from students and signing copies of his book, Campus CEO: The Student Entrepreneur’s Guide to Launching a Multimillion-Dollar Business, Dr. Pinkett spoke about how a key to excelling at innovation is accepting and learning from failure. He shared examples of the hardships black American role models such as media proprietors Oprah Winfrey and Cathy Hughes, as well as David Steward, Chairman, World Wide Technology, Inc., endured and overcame to succeed in the business world. To watch Dr. Pinkett’s presentation at Berkeley College in Woodland Park, click here. Also read more about Dr. Pinkett’s presentation as reported by NorthJersey.com, Newark Public Radio station WBGO 88.3, and FiOS1 News. For more information about Dr. Pinkett, click here. 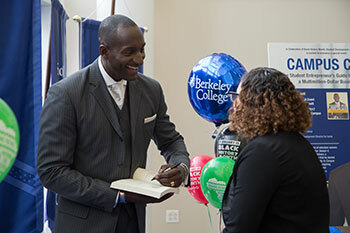 Photo Caption C: Entrepreneur and author Randal Pinkett, PhD, signs copies of his book, Campus CEO: The Student Entrepreneur’s Guide to Launching a Multimillion-Dollar Business, for Berkeley College students and faculty after addressing the importance of adopting an innovator’s mindset in Woodland Park, NJ, on February 15, 2017. To watch Randal Pinkett’s presentation at Berkeley College in Woodland Park, NJ, on February 15, 2017, click here.